15 oz. and very hefty. 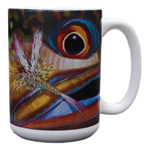 These full printed mugs showcase the best of Derek's Abstract Fish Flank Series in bright, vivid detail. Available in Rainbow, Brown, and Brook or Cutthroat. Buy as singles or as sets. Microwave safe, but not dishwasher recommended.